I Was A Boy Of 11 Walking From The Station To A Choir School Nearby - a Memory of Addlestone. In 1953 I attended, as a boarder, the 'St Mary of the Angels Choir School' in Addlestone. You walked from the station, turned right up the High St and then left up a hill(?). The school was down a long leafy drive. After I left in 1953, the school was burned down and transferred to Beaconsfield. Does anyone remember this fire at the school and what caused it? Google has incorrectly stated the fire occurred during the war, but i can positively confirm this was not the case as i was there in 1953 and the school did not move, due to the fire, until at least 1954. I remember on one occasion the Queen rode down the hill in a car and was waved to by all the school, staff and boys who stood at the end of the driveway! I have happy memories of Addlestone, especially buying a couple of buns in the little cake shop near the station when I was going home to my mum in South London for holidays! So can anyone tell me about the fire? It must have been big news as the whole school burnt down, apparently while the boys where in Devon singing. A memory shared by peter.beschorner on Jul 17th, 2014. Send peter.beschorner a message. I have lived in Addlestone since 1954 and can give you a little information, although no much. 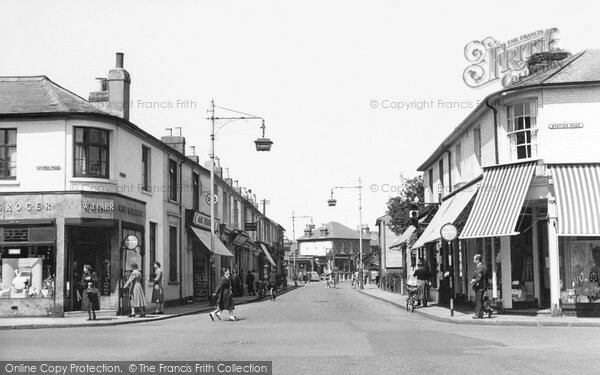 When you walked out of Addlestone station you would have turned left down Station Road which in those days had many shops and would have appeared to be the high St. Sadly most of those shops are long gone. On reaching the end on the road ( T Junction ) you would have turned left as you said and walked up Woburn Hill. I have researched the following. In July 1953 the Art of Movement Studio (now the Faculty of Dance, Trinity Laban) moved from Manchester to Addlestone in Surrey. It moved into a site that had previously been occupied by a choir school called ‘St Mary-of the-Angels’. The site had been purchased by William Elmhirst, son of the wealthy philanthropists Leonard and Dorothy Elmhirst, owners of Dartington Hall in Devon. William or “Bill” Elmhirst had been captivated by Rudolf Laban and his teaching at Dartington and was keen to support his activities. He purchased the Addlestone site for £15,000 for Laban and Lisa Ullmann. This would support your own memories of the fire not taking place until after it was sold in 1953.